One of my goals for 2017 was to track the amount of money I spent on the horses. I did so religiously through July. Then I fell off the wagon for a couple of months. I’d stuff feed store receipts into my wallet, ask the vet to email copies of my invoices, and make notes in my daily planner about a check I’d written the farrier. I had every intention of logging these purchases; I just never got around to it. Fortunately, I had some free time yesterday and spent an hour or so combing through my bank statements and making entries into my spreadsheet. The point of this exercise was observation- I really just wanted to see how much money I was spending. Barn: purchases for the barn itself, which includes things like equipment (manure forks, wheelbarrows, light bulbs, etc.) and stall necessities (shavings, buckets, etc.). Competition: expenses for competitions, like membership dues, entry fees, stabling fees, etc. I further subdivided to those categories, mostly so I could reference things in the spreadsheet more easily. 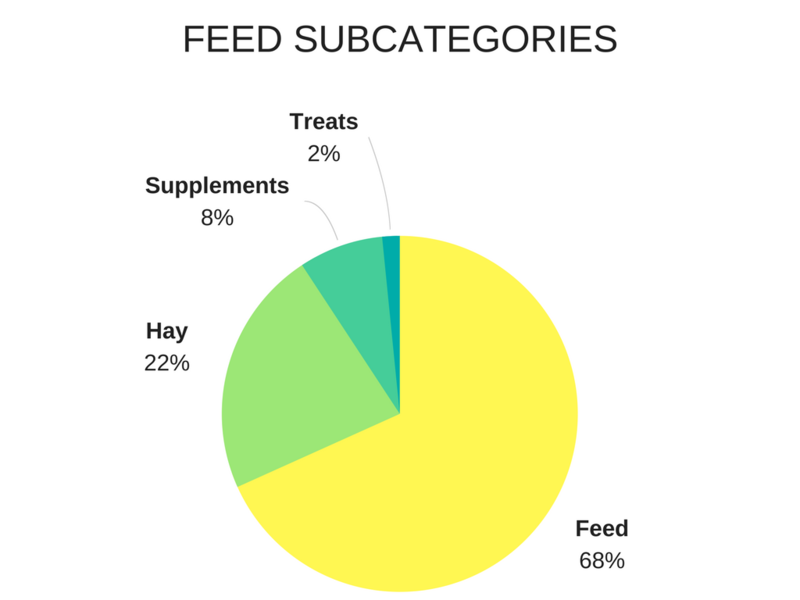 For example, I broke “Feed” into “feed”, “hay”, “supplements”, and “treats”. My horses would like you to know that the treat budget is not nearly high enough. Something I enjoy about being solely responsible for my horses’ care is that I make all decisions about what and how much to feed them. At the beginning of the year, I was buying a mid-priced feed and adding alfalfa pellets to it; additionally, Candy was consuming a fat supplement because she was thin. I wasn’t really satisfied with the feed, so I searched around for something else that would be easily available in my area. I settled on Triple Crown Senior, which costs more per bag than the other feed. However, I was able to drop both the alfalfa pellets and fat supplement. The cost works out to about the same per horse, but the horses’ weight is excellent, their coats are glossy, and I don’t have to do anything other than scoop one type of feed into a bucket. My hay spending has been higher this year than I anticipated, since the supplier I bought hay from last year opted not to bale this year. I had saved enough money to purchase 200 square bales of good quality grass hay at $5.50 per bale, which is the rate I paid last year to have the hay delivered and stacked in my barn. I had a difficult time finding a replacement supplier who would deliver the quantity I wanted- most suppliers wanted to deliver a semi-truck load of 750 bales. While I have plenty of room for 750 bales of hay, I do not have $4,500 to spend on it all at once. I’ve been buying square bales of bermuda for $8.75 per bale at the local feed store; it’s not my ideal situation, but at least it’s good quality. An interesting point about feed costs: per month, I’m spending about the same amount feeding 3 horses as I did on boarding one horse. That’s not the whole story, of course- this doesn’t factor in the higher mortgage payment, time spent feeding horses and cleaning stalls, or time spent making fence or barn repairs. Still, I think it’s worth it (for me) to have my horses at home! I’m glad I did this in 2017! 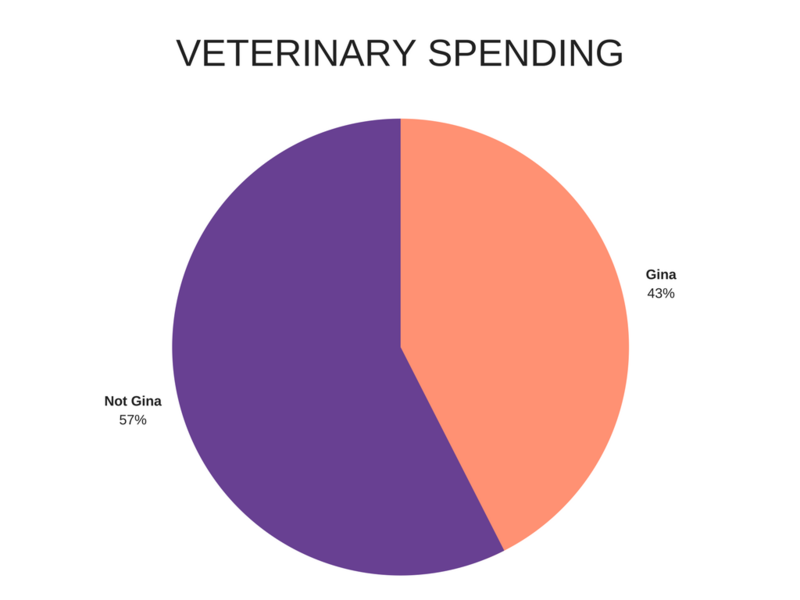 This data is very helpful, especially since I can use it to make an informed budget for 2018. Do you track your horse spending meticulously? I definitely don’t track my spending like you do. I’m kinda interested in doing it now though. I’m sure 80% of my budget will be board though. I don’t think the breakdown will be quite as interesting for a boarded horse versus horses at home like yours. 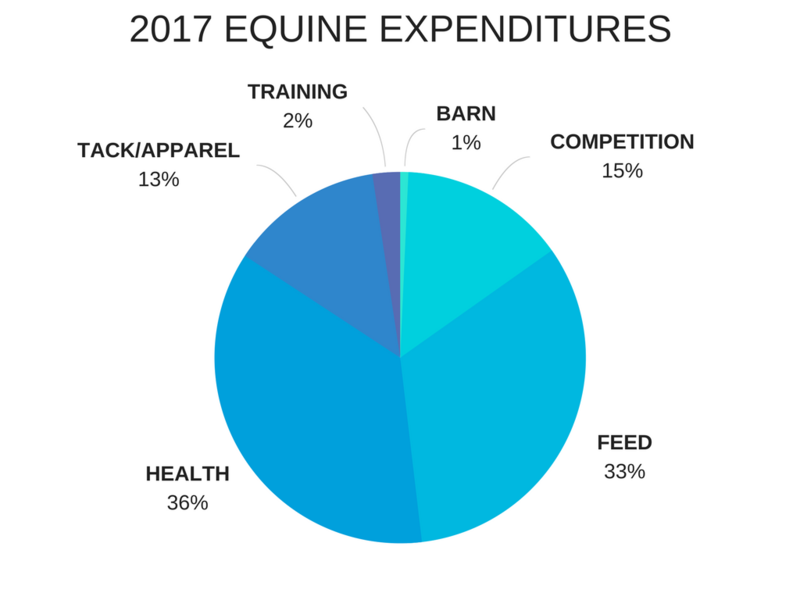 Board is definitely a significant expense for most horse owners, but it might be more interesting than you think to see how much you spend on competing, training, tack and apparel, etc.! Part of me thinks I should steal this and do it myself, but the other part would just rather not know…. That never ever ever worked for me until I actually STOPPED working there!!! Lol. Just too many of all the good things!! I could never work in a tack store. I’d be so broke! Totally fascinated by this! Thank you for sharing! No problem! I thought it might be interesting and possibly helpful for anyone thinking about keeping their horses at home. I really should, but I think I’d cry. Ooh, I am envious of your hay prices! I planned poorly and just got caught in the Xmas vortex of hay delivery and had to buy from the feed store to tide us over. $21.95 for a 65lb bale of timothy! Plus tax, lol, my two bales came to $48 something. I’m sort of afraid to know how much I’m spending….. I don’t track my horse spending this meticulously, but it wouldn’t be too hard to as I already keep an itemized budget spreadsheet! I have a certain amount allotted to spend on the horses monthly, but as long as I’m within budget in other places for the month, my horse spending may go up or down. I might cry a little if I actually itemized it more like what you’ve done here lol! I have a post scheduled breaking down my horse costs for 2017. The Canada/boarding situation certainly changes the breakdown but interesting to see the differences!